I find myself constantly trying to find the right definition of showmanship when it pertains to livestock. The Formula of Champions site has a really good description. It's basic, doesn't go into all of the details, or what if's of a show ring, but a good overall description. This year I found myself disappointed in the showmanship skills of my kids and those that I am working with. What have I done wrong? There is so much room for improvement. First and foremost, we all know that kids get tired of mom or dad always harping on them, sometimes it's different coming from someone else. Second is time, when you have busy kids you have to make the time for them to practice over and over until it is natural. Third, you have to review the what if's and how to adapt or correct them. We all know that showmanship matters in every single class, not just in the showmanship division. As our daughter begins her first official year showing and the other kids need a little more experience, I'm also in the business of helping newbies, so I better get my act together. Between looking up video examples, and practicing, my mission is to do better at demonstrating instead of telling. Instead of everyone having a fresh calf on the end of the halter and me telling them what to do, I should be demonstrating what I'm saying and how to avoid some of the what if's of a showring. For newbies at livestock showmanship, check out Formula of Champions!! Yesterday I found myself rooting for a few cows in our herd. I think this is pretty common among serious cattle raisers. Here are a few examples. Your last show heifer…every time you see her you beg her to please be bred, please throw one more calf, and could it act just like she did in the champion drive. Because let’s face it, if she isn’t bred she’ll take a trip to the packer or the sale barn. That second-calf cow that threw an incredible calf and struggled to make it five months to weaning time…please be bred. It wasn’t your fault, you were a heifer and we were pouring feed to you…please be bred. The cow that is always as big around as a truck. Tag #10 I know you carry a twin gene, (GG – she’s out of orphan Annie) but please just have a healthy calf, and if it’s twins, please be able to raise them. My spring schedule does not include bottle feeding a calf. The family favorite cow that was your daughter’s practice show heifer. Dear Snowball can you please have calves with your same personality. I could really use one gentle heifer every year that doesn’t mind learning tricks, getting covered in a towel when it’s snowing, practicing haltering and loading in a trailer, and learning to chase a girl with cubes in her pocket. To the cow that only has bull calves. Girl you are doing a great job, but we paid for your great bloodlines so could you pretty please throw one heifer in your lifetime. The cow that is on the fence, she goes in the sale pen and then she goes back out with the herd. Cow if you can hold out a few more weeks…maybe Ryan won’t have time to haul you to the sale barn and you can have one more calf here. You root for cows because you need a calf out of each and every one of them. And then you root a little harder for the ones that are special, have potential or meet a specific need. The kids and I name the special calves, Ryan calls them by the ear tag number. In the end as long as each one contributes to your herd in as breeding stock or for money to pay the feed bill, you are successful. Last weekend our electricity went out when the fabulous winter storm Jupiter hit the Texas Panhandle. Fortunately for us girls, and unfortunately for the guys...Tana and I were already in Ft. Worth for the Stock Show. We headed out before the ice storm to get set up and Tate's heifer adjusted to civilization. To say it has been a challenge would be an understatement. We still don't have power...and no I have not called the power company. As you drive into town there are still power poles on the ground. What would be the point of me calling to ask? Living the dark it not as big of an adjustment for us as most people. We spend a lot of time outside. And the generator that is hooked up does the job well enough. Enough being that you have to pick and choose what you turn on at the same time, no washing dishes and doing laundry at the same time! It will be nice to have full power back on, but living in the dark makes you appreciate life. This has also given me the opportunity to reflect on times we ask for questions and demand answers, knowing the other end can't give us the result we want. Then don't make that phone call. Until all the power poles are back up, there is no reason for me to call and pester an overwhelmed electric company on when MY power is going to be back on. They have much bigger projects and more important customers that can't live in the dark to take care of. There are times in life when it is important to reset. Pushing the control, alt, delete buttons. Regrouping mentally and physically. Finding your way. Setting new hopes, dreams and goals. I needed the last year and probably most of this year to find my way. I was never lost, but never knew my way. Full of ideas and dreams, and even a few written plans, but never a clear path. It's been a rough year on so many levels. And just when you look in the mirror and tell yourself it will get better, it really doesn't. I would tell myself if we could get through this project, or these three months of changes, it would be sailing. But in all reality something else pops up and you continue on the crazy whirlwind of life. What's happened in the last year - I learned to homeschool, then I took a new job. Ryan's company sold and he has a new employer. We jumped off big and have nine head in the show pen. The kids are a year older, wiser and busier. Ryan and I are one year older, our marriage has survived another year and we get grouchier on occasion! Another year went by that we didn't accomplish getting any closer to our hopes and dreams. This outlook on life is probably the only reason I was able to put a smile on my face in the Ft. Worth Open Show with a heifer literally facing the opposite direction. She wasn't cooperating with my plan, but it was still one step closer to our hopes and dreams. Look forward to blogging more, sharing a laugh, a cry and a serious thought. Lots of plans for 2017! I've been involved in several secret gift exchanges, but non like Christmas in the Country. The excitement of shopping for the gift receiver and getting your own package from the post office is like none other. Why you may ask...because these are like-minded, agricultural related people that you have been stalking for weeks! First, I was to send a gift to Robyn Goddard of South Dakota. I spent a few weeks looking through her blog, The Ranch Wife Chronicles, and learning more about her. What I found was that we are the same age, doing the same job, in very similar lifestyles. We have similar beliefs and could probably throw a great BBQ and have a lot of fun, laughter and serious conversations. Do I want to make a quick trip to South Dakota, absolutely! Second, I was on the receiving end of a great surprise. I received a box from Mexico, Missouri. At first I couldn't pinpoint why that would even seem familiar, but before I even opened the box I knew it came from someone that GOT me! Boy was I surprised to see Christmas in the Country from Melinda Bastian. Like us the Bastian's raise cattle, and especially show cattle. That is a whole different breed than the people who just run cattle on wide open spaces. This family understands the planning, generations, time and long hours of raising a calf into a cow that produces something that will spend a lot of it's life in a barn. The barn hours are long but so rewarding! First - notice the family picture. That was something I included with my package because I wanted someone to put a face with names immediately. There is also a cookbooks, something I sent as well. It's amazing how much this group of women have in common. 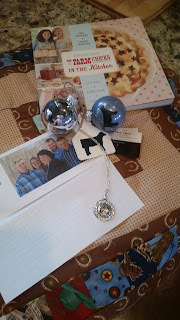 I also received a few Christmas ornaments with show calves and a show mom necklace that I can't wait to wear! There is also a hand stitched western piece that I have on a special side table. The thoughtfulness and excitement is overwhelming. The box also had candy canes...that my daughter stole! The thing that inspired me the most is that Melinda is a mentor. She's a mother, a wife and involved in the show cattle business. I hope to be able to communicate and ask questions as she's been in situations that I will be in soon. Thank you to the Christmas in the Country hostesses, Jamie (This Uncharted Rhoade), Laurie (COUNTRY LINKed), Lara (My Other More Exciting Self) and Kirby (15009 Farmhouse). I am already looking forward to next year! SUCCESS - is a ladder that cannot be climbed with your hands in your pockets.